It is always helpful to learn from other cohousing communities – both from their mistakes and their successes. There are quite a few opportunities to visit communities in the UK – join a gardening weekend at the Threshold Centre, pay a visit to one of Springhill’s open days. The UK Cohousing Network’s website gives details of UK groups. 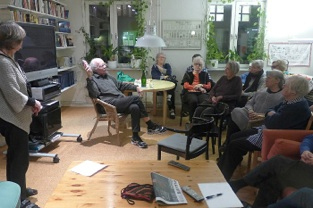 On a recent euro-trip to Stockholm, I had the opportunity to visit a number of Swedish cohousing communities, staying in one, eating meals and attending meetings in others. Cohousing in Sweden, it could be said, has morphed from a long tradition of ‘family hotels’complete with restaurant, built in the first half of the 20th century to accommodate working families, and enable women, especially, to take paid employment. They were not cohousing communities in that they were not necessarily as self-governing and as dedicated to community-building as today’s communities are. However, the many cohousing communities that have emerged in the last 25 years or so in Sweden have had a tradition to build upon, and not least a level of cultural acceptance in this comparatively small country that has been lacking in the UK. There are just over 40 cohousing communities in the country and their equivalent to the UK Cohousing Network is Kollektivhusnu. One group I visited was the purpose-built cohousing community of Fardknappen (which means ‘one for the road’) in Stockholm. Started in 1987 by a group of middle-aged people, it was built and is still owned by a municipal housing company, which rents it to the community. Each member pays for one of the 43 relatively small apartments of 1-3 rooms + kitchen and for a share of the generous common areas (400 sq m), which include a large modern kitchen, a dining room and lounge, and a craft room as well as a laundry, sauna etc. This and other purpose-built cohousing communities that I saw have been designed to have a central lobby or entrance area where everyone enters the building, and, in one case, where everyone comes to collect their mail too. Fardknappen, our first port of call, is not just for older people, but it is child-free, and about fifty people live there, some still working. The kitchen is large, spacious and beautifully equipped. They eat communally four or five nights in the week (except in summer) and have a rota of cooking teams which members are obliged to belong to, although they are not obliged to eat. Outsiders from the locality can also belong to the cooking teams as a way of joining in with the community. If you take advantage of the common meals, you are free from having to cook your own meals for weeks. They have sub-groups for other community activities like singing or music making. They share the cleaning of the common areas, also obligatory. Some of their rent comes back to them from the housing association as payment for the cleaning. There are many economic advantages to the degree of sharing they do – cheap meals, washing machines, ironing board, sewing machine, craft tools, TV, daily newspaper, Broadband – all are provided communally. What an advantage for people in the second half or third of their lives, to have around them all these resources plus many group activities and support available from neighbours they know. It is a place one would be happy to grow old in – though this community, like others, needs to keep a wide age-range and impose age requirements for new members in order for this state of affairs to be sustained. Members of Fardknappen have to apply to the group to be interviewed before they can join and the Board makes recommendations to the housing company landlord. This way, the group can filter out those only interested in the housing element so as to keep the cohousing ethos alive. Members we met were keen to emphasise that their cooking and cleaning teams are as much valued as the community’s leisure pursuits as a means of maintaining community spirit. I must say, the welcome they gave to some 20 of us foreign visitors felt warm and genuine and all the signs were that this is a well-functioning, cheerful community. I hope we in Cohousing Woodside can work towards developing some of these positive features of cohousing for ourselves. It takes effort but will, I hope, be well worth it in the end. If we don’t manage to make it how we like it, we might as well stay put where we live now, I guess. The next meeting, on Sunday April 6, will be an opportunity for us to consider these aspects of cohousing.